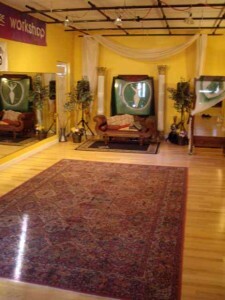 Looking to book a belly dance party hosted by Delilah & Co at VDP Studios? We offer rental of our studio for teaching classes, workshops, private parties and more! Click here for more details. Birthdays, Girls Scout meetings, Bachelorette Parties, Baby Showers, Rights of Passage, Wakes, Ground Breaking Ceremonies, and more. Anytime you want to recognize the presence of divine creative energy! We travel, or better yet, we rent out our studio with mirrors and furnishings. We can furnish hip scarves, veils and other paraphernalia to make the experience rich and fun. You can bring snacks and refreshments and take your time and hang out and open gifts or bring in other performers. Call and tell us your desires and needs. We love to help plan and make suggestions. We are looking to share our lovely studio space with the right person. Space is not cheap in Seattle for artists these days. I need to lighten my load a bit and at the same time, it might be an ideal fit for movement, yoga, music, drama, teacher, therapist, photographer or maybe a home school program or group looking for steady rehearsal space. It’s ideal for someone yearning to start up a business practice with limited overhead. Everything is already in place. It could be a win/win situation. VDP Studios has many unused studio hours available. Located in the Fremont neighborhood, our beautiful space is approximately 18ft by 40ft, has lots of mirrors, a dressing room and a bathroom. We have thirteen foot ceilings with an overhead light grid system. There are other rooms and some storage space for props and equipment. 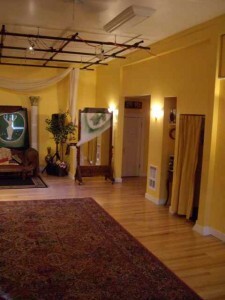 Our studio space is good for photo and video shoots, shoeless movement arts, such as yoga, ti chi, music lessons, lectures, seminars, demonstrations, rehearsals, meetings, movie showing and parties. It’s not good for dance forms with hard shoe requirements but we are amiable to rearranging rugs and furniture. We have a beautiful space with mirrors wood and/or oriental carpeted floor surface, light grid, Cd player, bathroom and dressing room. It’s located in the Fremont neighborhood of Seattle Washington (98103) 2 blocks off highway 99 with easy Free street parking. It’s a nice place to video tape your self dancing for self critique. Commercial project rates such as photography or video. BUY A CARD and receive big savings. You can reserve your hours as you need them no more than 10 days in advance of hours unused at VDP. (You need to check calendar). Most week nights Mon-Thurs 5-9 are usually booked but not always. Many Fri, Sat, Sun hours available and day time hours during the week. You can reserve as little as an hour at a time or multiple hours. To cancel and not loose your hours you must do so 48 in advance. Commercial projects needing long extended hours are not impossible and may require longer lead time. The cost will depend on various factors like compensation for canceled classes, wear, tear, heat and clean up. Reserving and renting the Studio for Belly Dance Workshops is not usually an option since that is what we do as a business is sponsor and host workshops and shows. However we do rent out for other arts and concerts. We have office phone, internet access, folding tables and some chairs, 2 large rolling mirrors, dry erase boards, sound system and dual lighting. We also have a refrigerator, microwave and hot water kitchen sink in separate room. VDP Studios is primarily an internet business and belly dance/Middle Eastern Dance studio in the evenings and occasional weekends. Instead of renting our studio out to belly dancers we hire instructors and handle student registration and promotion for classes and workshops. We have an established clientele and promotional machinery in place for our business of 20 years. Belly Dance instructors are welcome to apply to teach a class spot. Easy parking on the street, very good location. 3 blocks off Aurora and half way down the hill from the Woodland Park Zoo in Fremont .